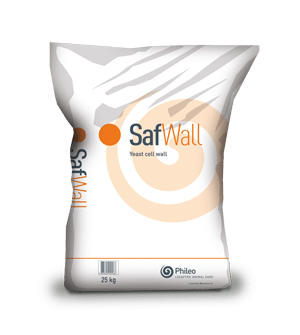 Safwall® is a yeast cell wall obtained from Saccharomyces cerevisae primary culture. The cell wall is separated from inner part of yeast by centrifugation and dried. Safwall® has a high affinity and a high capacity of adsorption of Zearalenon and Ochratoxin A in the intestinal tract. In case of multi-contaminated feed, complementary beneficial effects on the intestinal barrier integrity can help reduce animal exposure to other mycotoxins.